One of my favorite ways to share the Easter story with my girls is through a set of Family Life Resurrection Eggs that my mom gave us when our oldest was just a toddler. This set has been well loved, and at this point it has quite a few broken eggs and missing parts, so this year I decided to make a brand new set! If you’ve never seen resurrection eggs, they look like a simple set of plastic Easter eggs in various colors. But inside each egg is a symbol of the Easter story — a donkey for Jesus’ triumphal entry into Jerusalem, a die to represent the soldiers casting lots for Jesus’ clothes, etc. The beauty of the set is that kids get so excited to see what’s in each egg, and it’s truly an interactive and concrete way to talk about things that are hard for them to wrap their minds around otherwise. What I really love is that although we really only do them together as a family around Easter, the girls will occasionally grab the set to play with during quiet time, and those symbols remind them of the story as they’re playing. 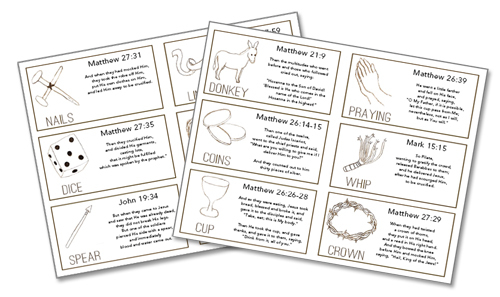 Making your own set is actually really simple, and it’s not too late to make one for Holy Week! Put one item in each egg, following the order on the cheat sheet. 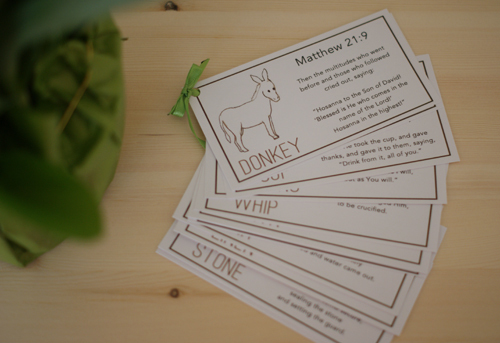 You’ll find accompanying Bible verses to help you tell the story, although I recommend paraphrasing for little ones! 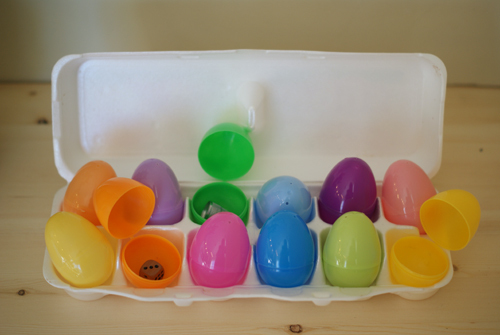 Use stickers to number the eggs from 1 to 12 to keep them in order. Print the 8-egg cheat sheet to make a smaller set of eggs (eliminate the scroll, piece of leather, die and cheesecloth). A friend of mine has four daughters who are spaced just like our girls (although each of her girls is about 10 years older than ours). Their second daughter, Waverly, is a talented artist, and as I was working on this idea, I asked her if she would draw the 12 elements of our resurrection eggs so that I could make cards to correspond with the eggs. I love how these cards turned out, and I’m so excited to share them with you! Print the Easter story cards to use with the eggs or to tie together with a ribbon as a small book (an idea that Waverly’s youngest sister came up). How do you share the Easter story with your kids? Hi there! Thanks for the resurrection eggs printables. I just wanted to let you know that I believe the empty tomb verse should be Matthew 28:5 not 28:25 as it says on all the printables. Oh, shoot! Making a note of this so I can get it fixed; thank you so much for pointing that out! this is brilliant, thank you so much fro taking the time to create this, I have been looking for it for years! I am using with my kids, sunday school this coming week and a women’s groups where English isn’t their first language, so a big thank you. That’s awesome, Emma — I’m so glad to hear that! Thank you for sharing, an appreciated blessing. Hoping my boys will enjoy hearing the Easter story in a more tangible way! You’re welcome, Lea — I hope you enjoy them! Barb Craft who invented these just passed away at 79 on March 7, 2014. Creative, blessed woman. Oh, thanks for sharing that; you’ve piqued my curiosity to learn more about their history and her life! 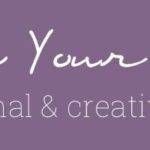 Thank you so much for sharing the printable ‘story’ This would be perfect to share with the international ladies I work with at our Easter party, using the resurrection eggs. Thank you for sharing this. I am living in Taiwan and I will be using this to share the Good News with my students here. I have even taken the cards and made them with Chinese. This was much appreciated! Thank you so much for these! I have a set of Resurrection eggs and the text that comes with them is long–a few pages with each. It’s too much for my class of mostly four-year-old boys to pay attention to. This should work really well. Oh, fun! I’m glad you’re able to use them! Thanks for posting this! We made them in about an hour and all with things we had on hand. Great project to work on as a team and great way to do something meaningful without spending a dime (well except for the 3 quarters…lol). I once read a story about a Sunday School class. The teacher gave each child a plastic egg, and took them outside with orders to find something that symbolized the Easter story. Afterwards, one by one they explained their choices: a rock, a leaf, a scrap of cloth, a flower bud, etc. A little boy with Down Syndrome was the last to share. With great ceremony, he opened his egg. There was nothing inside. The teacher wondered if he had understood the assignment. “Dear, why doesn’t your egg have anything inside it?” she asked. And that is why, whenever I do the resurrection eggs, the last egg has nothing inside it. I was introduced to the resurrection eggs by a relative and thought this is a grand idea to use as an Easter presentation to my church family on Sunday. Sorry to hear of the passing of Barb Craft for being the creator of this and thank you Mandi for sharing Life Your Way. the links to the cheat sheets are not working. Thank you so much for these! I then went back and read all the prophecies predicting most of these things making it even MORE amazing, now that my kids are a bit older. Thanks again! Bless you! This year was our first year doing resurrection eggs. I had never even heard of them before this year. We asked the Easter Bunny to skip our house this year and bless those who are less fortunate. Not the popular choice among our 4 daughters. But, we told them we really wanted to focus on the true meaning of Easter. We did a normal egg hunt hiding these eggs instead. I loved hearing them make the connections between the item in the egg and that part of the story. Thank you so much for the DIY! Thank you for sharing! I wanted to see if you have the printable done in Spanish? I would like to use them for some of my students traveling on mission trips during Easter this year. Thanks! I’m having trouble opening the cheat sheet links. Any tips?? Would love to use these! Thanks for the printables and lessons! While the “cheat sheet” links no longer work, the link that says “Print the Easter story cards” does work. The order of the eggs is the same order as the egg contents are listed in the supplies list (egg 12 is empty, since it’s the empty tomb). Thank you so much, Mandi, for taking the time to print all this out, taking pix, and making a PDF so it now can be used in my Sunday School class tomorrow morning! What a huge blessing!! Thank you, thank you!